The Przebinda family is genetically burdened with the love of reading. Igor, who graduated from film studies, consumed everything that was printed on paper since he was three, trying to emulate his father, who in 1984 sat huddled over footnotes and comments to the Master and Margarita, published in the second series of the National Library collection. When Igor became an older brother, he could stretch his imagination, thinking up stories for his sister, Aneta. Then he became fluent in French, proficient in English and a pretty good basketball player. When he was ten, he became fascinated with Master and Margarita, and after first time, he kept returning to the novel every few years. Of course, he read it in the first Polish translation by Irena Lewandowska and Witold Dąbrowski. Aneta – who studied sociology – went through similar steps with the lecture, with the only exception being that she read the second translation by Andrzej Drawicz – a friend of the family – published in 1995. Leokadia Anna, their mother, has a doctorate in humanities, expert in Slavic and Polish studies. For many years she worked on lexicographic projects at the Polish Academy of Sciences, currently she teaches at the Stanisław Pigoń State School of Higher Professional Education in Krosno. Her articles were published in Język Polski, Studia Gramatyczne, Przegląd Rusycystyczny and Socjolingwistyka. Recently, she became interested in the issues connected with translation studies and intercultural communication. Her newest publications concern the phenomenon of Vladimir Nabokov – a bilingual writer and an unrelenting, yet sometimes controversial translator. The years 1984-85, marked with extensive hand-written correspondence with Elżbieta Lempp, who lived in North Carolina at the time and waited for all news from the home country, was one of the most important phases of her life. The exchange of letters between the photographer and the linguist, who lived with her husband and young Igor in a small village near Czernichów, were a start of a cordial friendship. 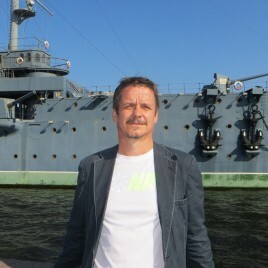 Grzegorz, the father is an avid expert on Russian studies, a historian of ideas and expert on Russian philosophical and religious thought. His scientific passions were always turned towards Russia, even despite the fact that it often meant working solely for the idea. And really, everything turned out for the best, since he became a professor at the Jagiellonian University after working on things he always loved. He published nine books, including collections of essays: Zaułki mistrza Wolanda and Piekło z widokiem na niebo. Spotkania z Rosją 1999-2004, recently he also published a volume of works in Russian: Между Краковом, Римом и Москвой. Русская идея в новой Польше. For his “outstanding achievements in research and scientific pursuits in East Slavic languages and cultures, as well as supporting the international scientific cooperation”, he was awarded the Knight's Cross of the Order of Polonia Restituta in 2015. He conducted and published interviews with Natalia Gorbaniewska, Władimir Bukowsk, Gieorgij Władimow, Bułat Okudżawa, Jewgienij Rejn, Wiktor Jerofiejew, Władimir Makanin, Dmitrij Bykow. Among the things the Przebinda family is passionate about is travel, and in the recent years it has become an even more central part of their life, since the head of the family decided that it was time to start running classic marathons at the age of 50. As of now, he has already run 14 of them, some of them in the cities where the plot of Master and Margarita takes place – Jerusalem, Moscow and Saint Petersburg. The marathons were a perfect opportunity to spend a while on contemplating in Jerusalem, in the places where the biblical episodes of Bulgakov’s novel take place, as well as for family walks on Patriarch Ponds, Sparrow Hills, Tverskoy Boulevard with the Griboedov house and the Novodevichy Cemetery, where the grave of Mikhail Bulgakov and his wife – Helena – can be found.